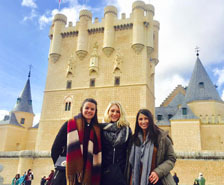 The Syracuse Madrid Study Tours are typically full day trips that fall under the Culture & Heritage stamp category. 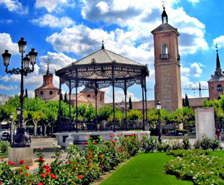 Pay a visit to the Roman city of Complutum origin of Alcalá de Henares, birthplace of the writer Miguel de Cervantes, author of “Don Quixote”and home to one of the most prestigious universities in Spain. Alcalá will amaze you with its monumental churches, convents and picturesque streets. Toledo has sometimes been called a “summary” of the history of Spain, and many Spaniards don’t hesitate to declare that if a tourist only had one day to visit our country, it should be spent nowhere other than in Toledo. We offer our students the possibility to relive for a day the drama and excitement of some of the most amazing chapters in human history while enjoying this beautiful and historical city. Perched high up on a hill and surrounded by the Tajo River on all but the north side, Toledo looks to the visitor more like a stone fortress than a city. Situated in the center of the peninsula, Toledo was an important Roman center. In the Middle Ages, Muslim conquerors turned it into one of their most important outposts at the frontier with the Christian north. After 1085 and the Christian reconquest, its privileged situation, high on a rough hill and with a wide river surrounding it on all but one side, turned it into a natural fortress. Humans did the rest, by raising stone walls that seem to grow out of the ground to protect the buildings that crowd the landscape. In the past, and perhaps even more today, Toledo was known as “the city of the Three Cultures,” because after the Islamic invasion, under tolerant Muslim rulers, an important Jewish population and a Christian minority shared space and lifestyles with their Islamic lords. That “convivencia” (a word many historians often use today to describe the circumstances of that unique era) and which roughly means “being able to live together in peace,” has left amazing witnesses: beautiful synagogues, mosques, and churches. In the 16th century, at the height of the Spanish Empire, Toledo became the “Imperial City” par excellence, with Spanish kings ruling often from the majestic castle that looms high above all on top of the highest hill of the town. El Greco, one of the greatest painters of that time, lived and worked there, and it is in Toledo that he left some of his most beautiful paintings. With the rise of Madrid as formal capital of the kingdom, Toledo lost its luster and became a city anchored in time, a living museum of Spanish history. But with the growth of tourism in Spain, Toledo has now become not just a favorite, but a “must” for Madrid visitors. 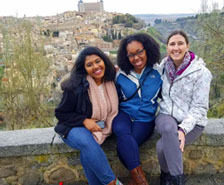 Syracuse University in Madrid offers precisely that possibility, allowing its students to relive for one whole day the drama and excitement of some of the most amazing chapters in human history while enjoying this city full of beauty and history. Segovia is a quaint medieval town built around a beautiful castle, a magnificent Gothic cathedral, and an impressive Roman aqueduct. There we will see life as it existed before Spain became a world power. Segovia is a World Heritage City, with unique monuments which alone make a visit well worthwhile. However, once in Segovia you will find the city offers much, much more. An old Jewish quarter, stately homes, outstanding views, and a green belt which is ideal for a pleasant stroll in the sunshine. We will understand the importance of water and of fortifications for the Middle Ages; how after bloody civil conflicts between factious kingdoms, Spain became a single country under Ferdinand and Isabella; the importance of Segovia to Queen Isabella, and the conditions that moved Spain from its sideline position as a fledgling nation on the outskirts of Europe, to the center stage of world history with the conquest of Granada from Islam, the creation of a strong unified monarchy, a series of dynastic marriages with the most important royal houses of Europe, and last but not least, the dispatching of Cristopher Columbus into the Atlantic in search of a shorter route to the kingdom of the spices in India but which resulted in the discovery of the American continent to Europeans. In Segovia you will feel and taste Spain’s very essence. El Escorial is an awe-inspiring palace-monastery complex just outside Madrid which served as the residence of King Philip II and his court. Declared a World Heritage Site by UNESCO in 1984, the Monastery and Real Sitio de San Lorenzo de El Escorial is the soul of this mountain town, which attracts thousands of visitors every year. El Escorial is one of the most amazing buildings, not just in Spain, but in Europe. From a series of small kingdoms lying on the outskirts of Europe (15th c.), under king Ferdinand of Aragon and queen Isabella of Castile, Spain went on to become the ruler of the mightiest empire the world had ever seen. First came the unification of Castile and Aragon into one single nation – what we now know as Spain. Since the late Middle Ages, Aragon had built up a considerable empire of its own in the Mediterranean, with the conquest of Mallorca, Menorca, Sardinia, Sicily, and southern Italy. Those territories became part of the newly unified crown. Through dynastic marriages, the grandson of Ferdinand and Isabella, Charles V, inherited also the Low Countries (today’s Belgium, Holland, and Luxembourg), and after Columbus’s venture and the quick conquest of the Caribbean, Mexico, and Peru, he added to the crown a whole new continent whose discovery changed the world. It was under Charles’s rule that the modern era was born. 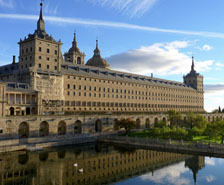 But the Escorial is also a compendium of the Renaissance: that rebirth of learning, of Humanism and of Roman Antiquity that serves as guidelines for a new understanding of reality, and which became visually embodied in this palace’s awesome architecture, full of classical reminiscences and symbolism.